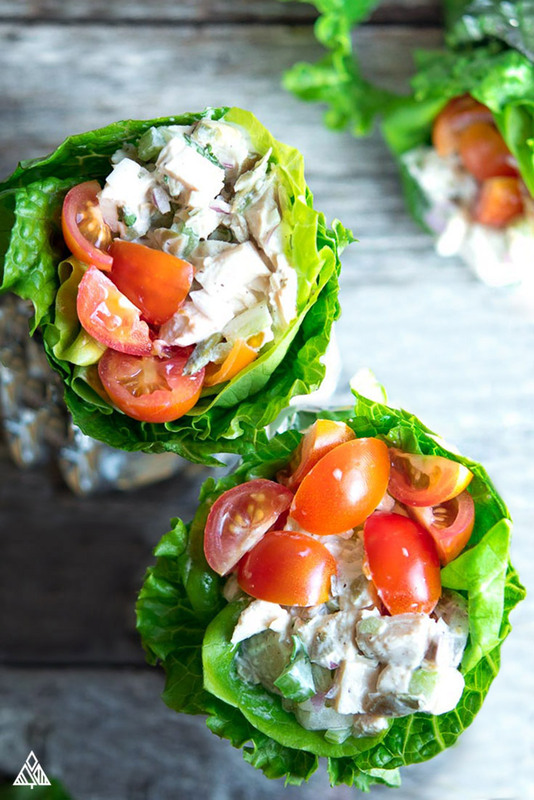 Whether you’re picnicking on the beach, or prepping wraps for the work week — this easy low carb chicken salad is the creamy, protein packed lunch you’ve been looking for! 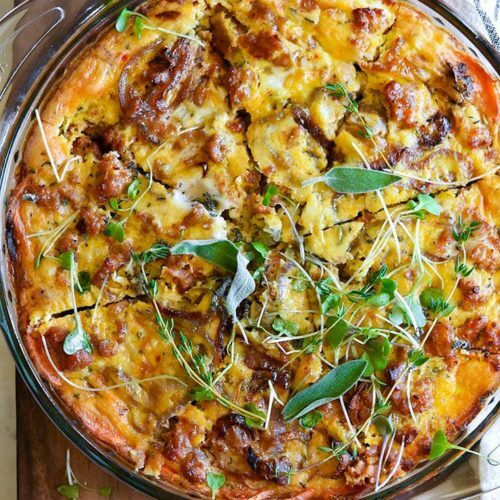 Plus, it’s so tasty, I don’t want anything else — and with all this low carb recipes variations (listed below), it’s impossible to get tired of! So, grab your bowl and let’s get to mixing! Can’t wait to see the variations you guys come up with. Man, is this keto chicken salad delicious! Like the traditional recipe, low carb chicken salad is made with chicken (duh), mayo, lemon juice and a few veggies. Luckily for us sticking to low carb foods — the main low carb veggie used is celery. Celery adds a delicious crunch to this low carb chicken salad with only 1.5 grams of carbs per ½ cup! Then we’ve got red onions, which are a little higher in carbs ( 3.7 grams per ¼ cup), but the flavor they bring to this salad is part of what makes it so addicting! 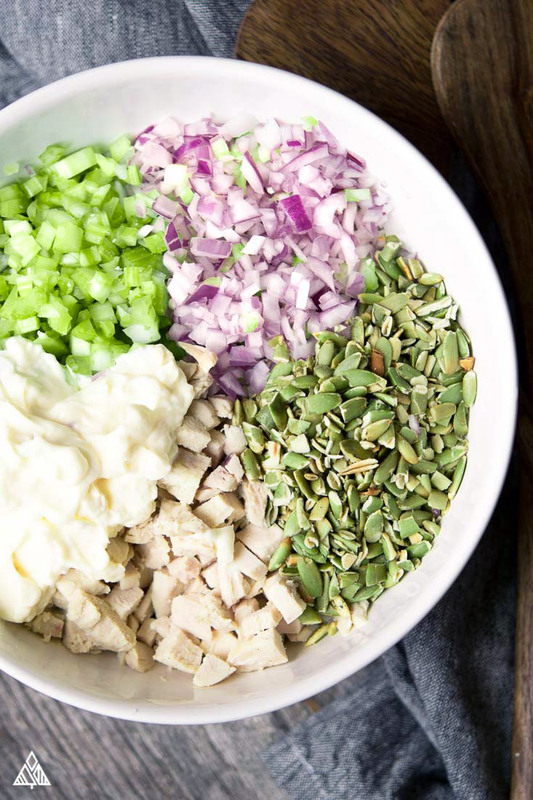 Confession: when I make low carb chicken salad for myself, I double the onions. 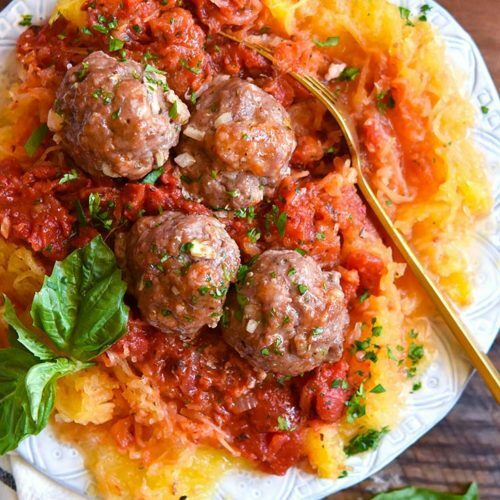 Do what works with your eating plan — to me a few extra carbs for all that flavor are worth it! When I’m in a rush, I buy precooked chicken and dice it up. Saves a few minutes and a ton of dirty dishes. But, if you’d like to save some dough, I’d suggest boiling your chicken — this is crazy easy to do, and doesn’t require you to babysit a grill or stir. If you go this route, allow the chicken to cool before dicing or shredding it. I’m not the biggest fan of canned chicken, but a few people have asked if this works as a canned chicken salad recipe. If you choose this protein source, allow the chicken to drain on paper towels before adding in the other ingredients. The remaining ingredients in this low carb chicken salad, are mayo (we’ll talk about that below), lemon juice and pumpkin seeds. Pumpkin seeds add a delicious, salty crunch to the mix. 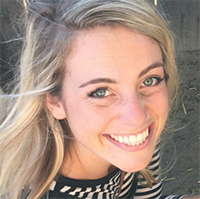 Plus, they’re super high in protein and low in carbs: 9.7 grams of protein per ¼ cup and only 3.4 grams of carbs! As with most of the recipes I seem to post on Little Pine Low Carb, this is one of those low carb salads that’s crazy customizable. Since we aren’t cooking or baking this recipe, feel free to stir in or leave out any ingredients you like/dislike along the way. I didn’t tell anyone which was which, I just gave them a scoop of each. Each and every person told me they’d like the mayo chicken salad better. Wanna know which one was EVERYONE’S FAVORITE? I know, they were surprised too. Every single one of them prefered the Greek yogurt chicken salad! Now, I will tell you this, using Greek yogurt will add a few extra carbs to the mix. I use Fage 2% (I recommend this brand, as not all Greek yogurts are low carb Greek yogurt.) 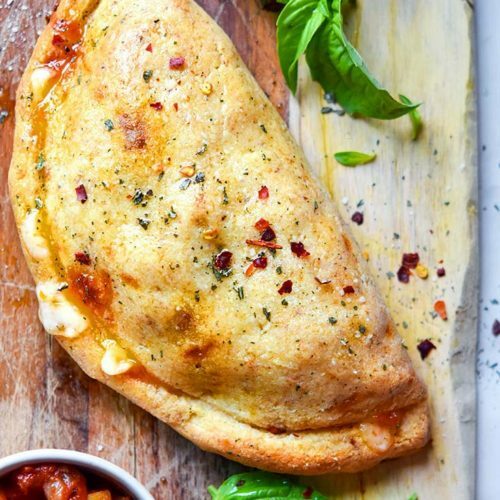 Which has 3.5 grams of carbs per ½ cup — whereas mayo has 0.63 grams of carbs per ½ cup. Another alternative to mayo is making a keto avocado chicken salad! Delicious, and beautifully colored — my only gripe with low carb chicken salad with avocado is that if you don’t eat it right away, the avocado turns an unappealing brown. Of all the chicken salads, curried chicken salad is my favorite. This is typically made with a ton of extra spices, raisins and carrots — the last two aren’t low in carbs — but, if you’re looking for sassier salad, just add some curry seasoning to this recipe! Easy low carb lunch to Meal Prep! Low carb lunch can be hard to plan for — and eating out for every meal can add up quickly. Plus, how many grilled chicken on iceberg lettuce salads can you eat a week? 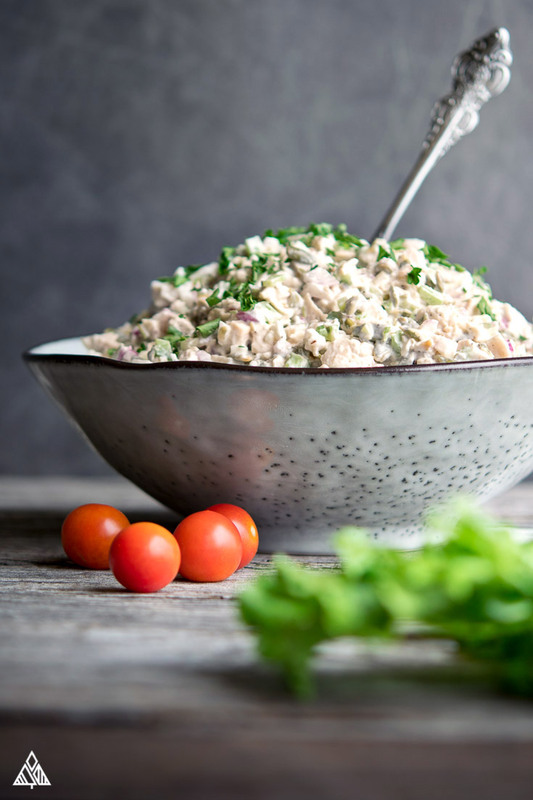 I find the best way to stay low carb during lunch hour is with a little low carb meal prep — and this low carb chicken salad is one of the easiest recipes to prep ahead in anticipation for your busy work week! 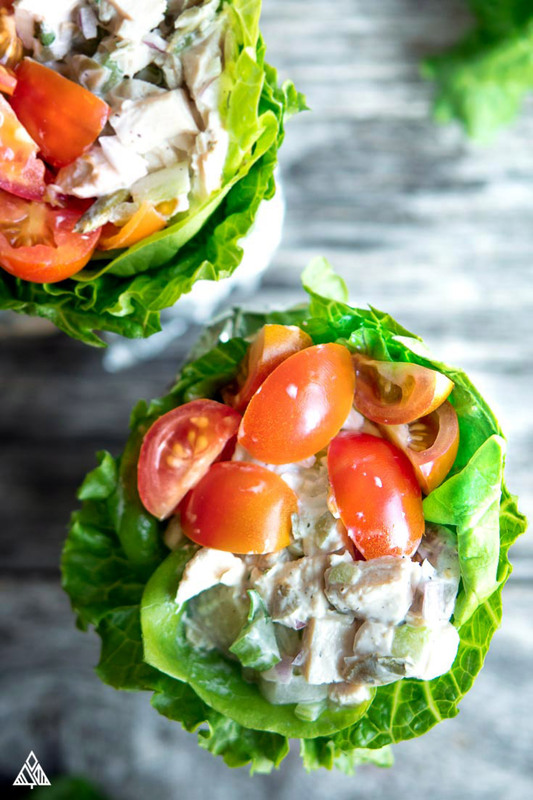 Do as I did in the photos and make low carb chicken salad lettuce wraps using large leafy lettuce! 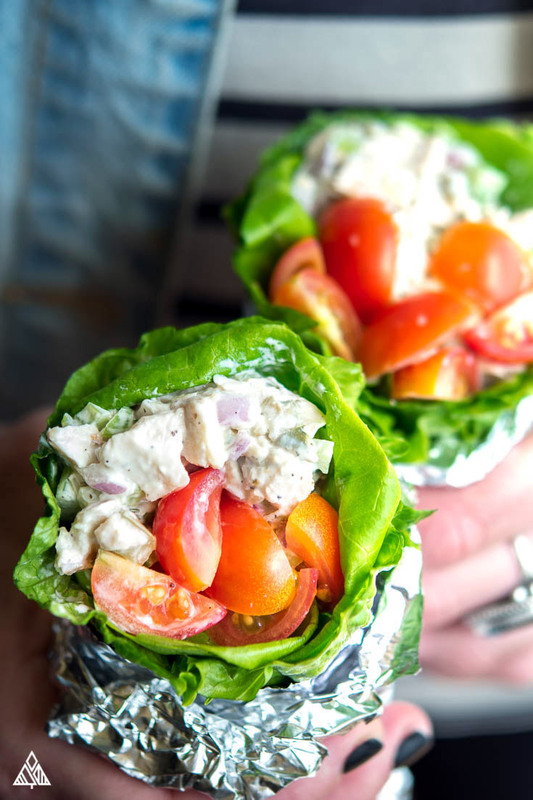 Hold your wraps in place with foil for one of the most delicious low carb meals your coworkers are sure to be jealous of! I hope you all love this basic chicken salad recipe as much as I do! 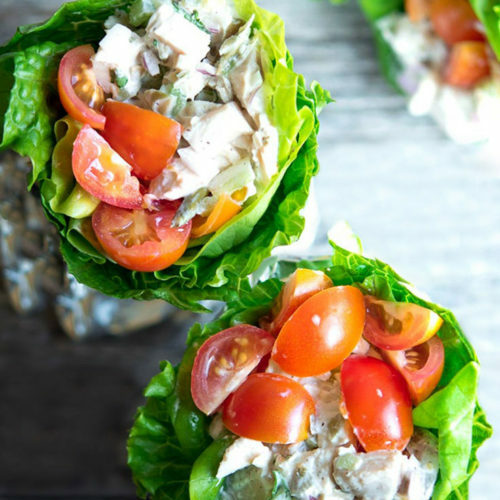 Whether you’re making a keto rotisserie chicken salad or adding a few grapes for a low carb chicken salad with grapes, low carb chicken salads are a delicious way to meal prep, sneak in some protein and satiate those taste bud. Enjoy friends! Let me know what modifications you try in the comments below! Easy low carb chicken salad is the creamy, protein packed keto lunch recipe you’ve been looking for! Bring it to a picnic, use it for meal prep — with all the possible variations, you'll never get tired of it! Toss all ingredients in a bowl and mix until combined! Eat with a spoon, inside a lettuce wrap or on top of an avocado. Enjoy! Double the red onions if you don’t mind a few extra carbs and a lot more flavor! This Chicken Salad is off the charts AhhhMazing! !